Vikings running back Dalvin Cook is expected to play on Sunday against the Cardinals, a league source told the Star Tribune on Saturday night, but the team will have Cook on a limited snap count as he continues to work back from the hamstring injury he sustained in Week 2. 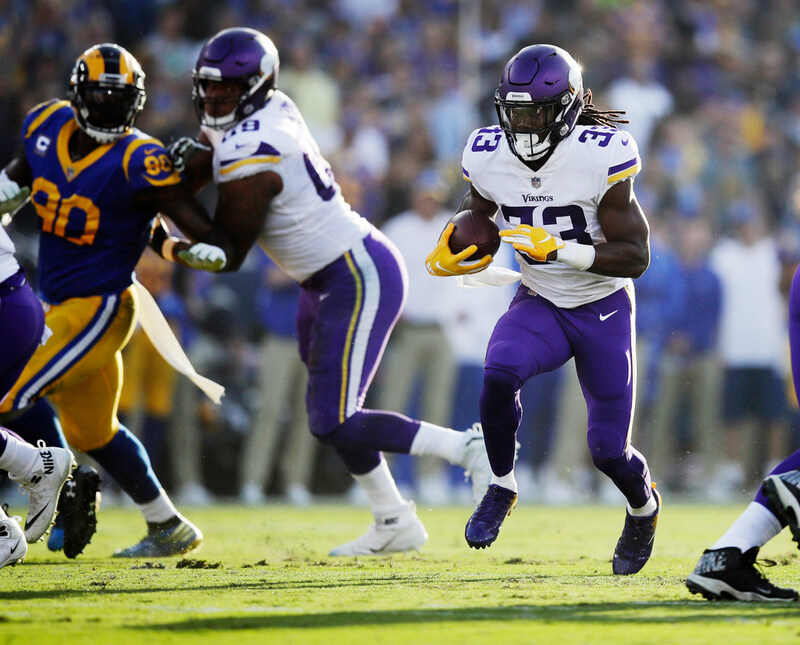 Cook said on Friday his hamstring is feeling much better, but added he would have to feel out how much he can do in a game and said he didn’t want to play if he wasn’t healthy enough to help the Vikings. The team evidently is optimistic enough about Cook’s health to play him against the NFL’s second-worst run defense, but Cook is expected to be limited to no more than 20 to 25 snaps. The second-year back has missed two of the Vikings’ last three games, playing only 18 snaps on Sept. 27 against the Rams in his only action since sustaining the injury. Cook gained 20 yards on 10 carries against the Rams. 2. After Dan Bailey missed a pair of field goals last Sunday in Philadelphia, hitting the left upright on a 28-yard kick and pushing a 45-yard attempt wide right, it appeared the Vikings’ kicking issued had returned to revisit the veteran they’d signed in September to solve their pernicious problem. That Bailey was able to make a 52-yarder to pad the Vikings’ lead — and, in effect, win the game in a 23-21 victory over the Eagles — gave the team hope he would be able to shake off the misses that had affected younger kickers like Blair Walsh and Daniel Carlson in the past. As Bailey heads back indoors on Sunday against the Cardinals, special teams coordinator Mike Priefer sounded hopeful Bailey’s misses would be a blip on the radar. “Glad Dan was our kicker at the end of the game where when Coach Zimmer asked me, “Hey, can he make it?” We got it,” Priefer said. “It was a great call by [offensive coordinator John] DeFilippo how we got third and long, we got it to fourth and manageable where we got a 52-yard field goal instead of 58-yard field goal. I would not have recommended a 58-yarder there just because it was a six point game, but the 52 he’s got to go out and make it and I was fully confident that he would go out and do that. I thought we protected well all day. For the most part the snap and hold were good. On the first one it was not, which is one of the reasons why he missed it. 3. The Vikings were 1-for-4 in the red zone on Sunday against the Eagles, and DeFilippo — who had been in charge of Philadelphia’s red zone package during his role as the team’s quarterbacks coach the past two years — attributed some of the team’s struggles to the Eagles’ ability to pass off receivers in zone coverage. “We knew going in they were a really good red zone defense,” he said. “They did a really nice job of passing two plays off. We tried to get their eyes in another spot and go back to the other side. It worked. It got their eyes in another spot but they did a really nice job of passing the play off. Obviously, [Eagles defensive coordinator] Jim Schwartz does a great job. I’ve worked with the guy for two years. He is a fantastic coach. He had those guys schooled up the amount of pick plays that we like to run. ‘Pick’ is the wrong word — we don’t run pick plays. Rub plays. I’m sure he had those guys well versed on some of those things that we like to do down there. 4. The last time the Vikings played the Cardinals, on Nov. 20, 2016, Xavier Rhodes had a 100-yard interception return of Carson Palmer that still stands as the longest defensive TD return in Vikings history. Rhodes had two interceptions that day, also adding three tackles. 5. The Vikings quietly released wide receiver Tavarres King and Horace Richardson, who had initially been placed on the waived/injured list at the end of training camp, saving roughly $700,000 in cap space this week. They now have $1.241 million in cap space, though they currently still have less room under the cap than any team in the NFL.